Ivy Walz, DMA is a teaching artist dedicated to helping students develop a healthy singing technique that spans across musical genre. In voice lessons Dr. Walz brings joyful dedication to working with each student individually to help them develop the skills for singing success. Her teaching is informed by deep knowledge, experience, and a commitment to lifelong learning. She creates a safe space to nurture the developing singer; encouraging expression, creativity, improvisation and musical growth. In voice lessons students learn to engage in effective practice, how to properly care for the vocal instrument, and essential skills in the categories of articulation, resonance, breathing, healthy phonation and body awareness. Dr. Walz is proud to serve on a collaborative faculty, and helps students to make connections between their studio work and their course work so that they may learn to synthesize across their chosen curriculum. Dr. Walz also teaches Basics of Vocal Mechanics, a class that is part of the Vocal Pedagogy curriculum. In this course students study the anatomy and physiology of the vocal instrument through a variety of learning modalities. An active performer, Ivy Walz has performed with Cincinnati Opera, Syracuse Opera, Des Moines Metro Opera, The Spoleto Festival, Tri-Cities Opera and at other regional venues. Favorite main stage roles include Cherubino in Le Nozze di Figaro, Nicklause in Les Contes D'Hoffmann and Dido in Dido and Aeneas. She most recently performed the role of Madame Larina in Syracuse Opera’s production of Eugene Onegin. She has worked extensively as a concert soloist. Recent highlights include Prokifiev's Alexander Nevsky, Handel's Messiah, Mozart's Mass in C minor and Bach's Johannes Passion. 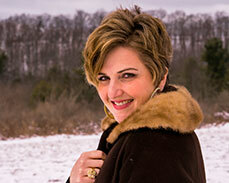 A proponent of the Art Song Recital and Contemporary American Music, she has worked with numerous living composers. She has enjoyed invited collaborations with Finger Lakes Chamber Ensemble, SongFest, Cincinnati Art Song Initiative and Denver Art Song Project. She was a semi-finalist in the Joy in Singing Competition, and a regional finalist for the NATS Artist Award. Ivy Walz serves as Treasurer for the Central New York Finger Lakes chapter of the National Association of Teachers of Singing. She is a graduate of the College Conservatory of Music at the University of Cincinnati, DMA (2014) and Ithaca College, MM (2002) and BM in vocal performance and music education (1998).